Below, you can see the familiar format of the birthday card: a partial sentence on the outside of the card, followed by an ellipses (thatâ€™s three dots, like this â€¦). Then the birthday boy/girl opens the card to reveal the (often surprising) finish of the sentence. To the nicest person I knowâ€¦ Â Â Â Â Â Â Â Â Â â€¦ Happy birthday! I was going to buy you a present â€¦ Â Â Â â€¦ but I’m cheap. Happy Birthday! You donâ€™t look one day overâ€¦ Â Â Â Â Â Â Â Â Â â€¦ the hill. Happy Birthday! idiom: over the hill = past the peak of your health and vigor. Below youâ€™ll find some activities for Birthday Cards. Do them in the following order to make a full lesson, or choose those thatâ€™ll will work with your class or level. Here are five of the many birthday cards that I actuallywrote and tried to sell to a greeting card company. Alas, no one bought them. These birthday cards are intended to help us laugh at our worries about aging. So they are probably not useful to young learners. Match the first half (the outside of the card) with the inside (the punchline or funny part). A. â€¦ you donâ€™t even act it. B. â€¦ because itâ€™s from me, stupid! C. â€¦ Deal with it! D. â€¦ is better than a birthday without presents. Now youâ€™ll get the first halves (the outside) of five birthday cards. The studentsâ€™ job is to finish them, to write the inside of the card. Work in pairs. Students may be polite or funny. Creativity should be rewarded. (Afterwards compare students answers with the originals below. 4. Trying to hide your birthday againâ€¦? Write and design your own birthday cards. Fold a paper in half. On the outside draw a picture and make some words. Design your own birthday card. 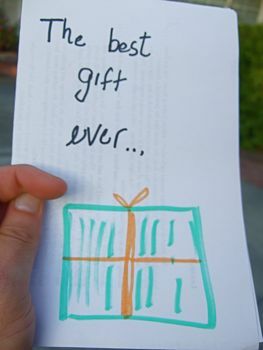 This activity works great for any level: young learners will write basic wishes. Advanced learners can use wit, wisdom, rhymes, or puns. There are lots of other types of cards, generically called â€œgreeting cards.â€ There are cards for religious holidays, weddings, condolences, births, anniversaries, graduation, job promotions, celebrating friendship, Valentineâ€™s Day, Get-Well-Soon cards for sick people, and more. Have students write some of these. And letâ€™s say the class comes up with some great ideas for cards. Why not submit them online to a greeting card company to see if they will buy some? Who knows? 2. You donâ€™t look your ageâ€¦ â€¦ You donâ€™t even act it. 3. Youâ€™re not as old asâ€¦ you will be tomorrow. 4. Another birthdayâ€¦ â€¦ Deal with it! 5. 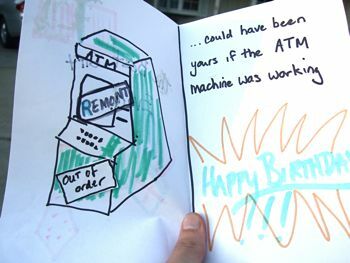 Never throw this birthday card awayâ€¦ â€¦ because itâ€™s from me, stupid. 1. Youâ€™re at the age whereâ€¦ your inner child has reached adolescence. 2. No way Iâ€™d forget your birthdayâ€¦ Not now that youâ€™re this old. 4. Trying to hide your birthday againâ€¦? â€¦ Nice try. 5. I baked your favorite cakeâ€¦ â€¦ Man, was it good.